It was a very sunny Saturday morning when I met Mary and Adrian at Leura. Not long after Ulla and Matt rocked off the train. I had been waiting for it seemed years (actually, only 11 months) to go down Butterbox Canyon, and this weekend was the perfect time for it. We excitedly drove out to the end of Mt Hay Road, only stopping shortly to give a couple of walkers a lift out to Lockleys Pylon. Heading down from the carpark, it wasnt long before we were down the first few abseils that brought us into the main canyon. Those first few abseils are super slippery though, so there was a lot of slipping, sliding and swearing which made it all the more fun. Hopping into the first swim, it took at least until the halfway point until I could not feel my hands anymore, but I am sure the feeling came back sometime during the day. Another abseil and scramble later and we were at the start of the plunging chockstone abseil. 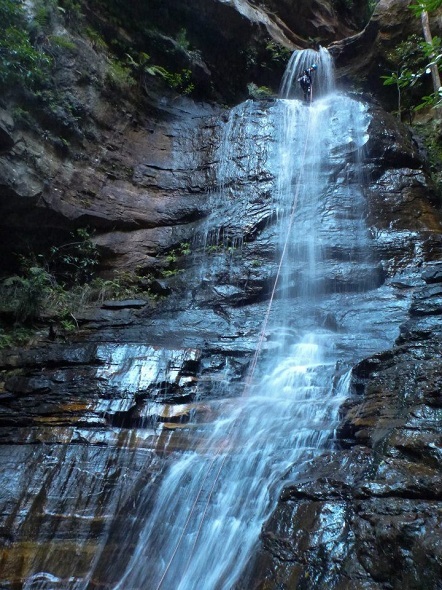 This two-part abseil is absolutely spectacular, and I cant wait to get back and do it again, hopefully in a little more water. A couple more jumps and swims were all that was left until the abrupt end of the canyon. We scrambled down and did one more abseil to get to a nice, sunny lunch spot. After a quick feed, and drying off, we took the quick route up the ledges to the climbing exit. Ulla led the climb, which now has a fixed rope, and belayed us all up to the top. A quick steep climb and mosey over the hill was all that was left to get back to the cars nice and early. Early enough for a quick jaunt through Empress Canyon before dark. We dashed over to the Conservation Hut and practically ran down, through the canyon, and back up the hill in a not-so-leasurely hour and five minutes. Empress only gets better for me. Super convenient. Sunday morning didn’t fill all of us with too much joy, as it was fairly overcast and a little on the cold side. We knew that we would warm up on the walk in, but Ulla still had to pull out of the days proceedings due to illness. No way back into town for her though meant that she unfortunately had to wait back at Mt Wilson for us for the whole day. The rest of us made short time of the trip down to the Wollangambe, and climbed up the ridge on the other side to the drop into Geronimo Canyon. Geronimo actually exceeded my expectations. While no Claustral or Butterbox, it is still a reasonably well sustained, neat canyon. 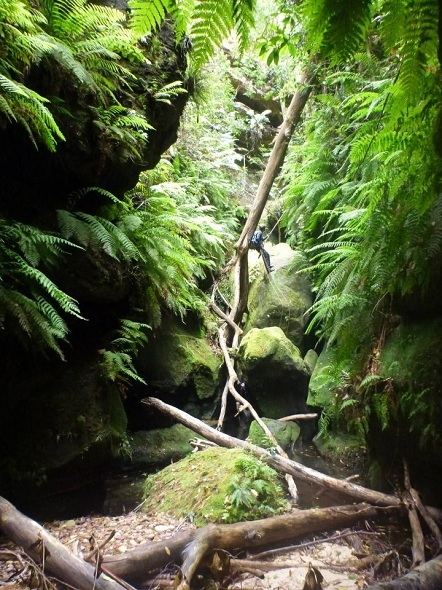 Nice and twisty with excesses of green ferns and moss. We abseiled down the first two small drops which were quite neat, but had a lot of manky and dirty water. After abseiling down the optional (GERONIMO!!!) jump, I immediately regretted it. It was quite jumpable, and something that I will have to revisit on a return trip. It must have been an optical illusion, because it didn’t look deep at all. 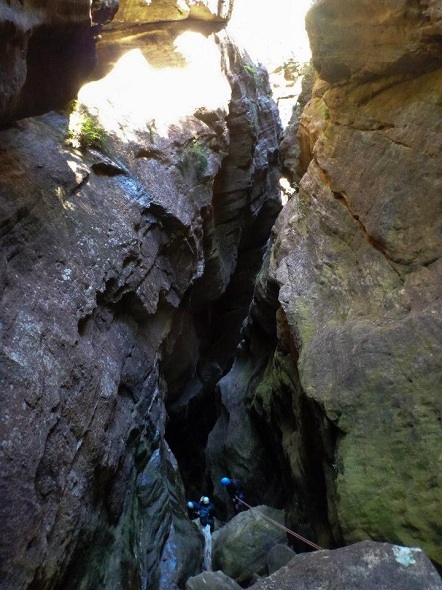 A bit more scrambling, and another abseil brought us to the end of this nice little canyon. Back down the Wollangambe and up the ridge (for the second time). We paused on top for lunch before dropping down the opposite side into Horseshoe Canyon. A lot of creek bashing has us all wondering when it would, if ever, start. It did though, spectacularly dropping into a short, almost underground tunnel section, not unlike Starlight Canyon. 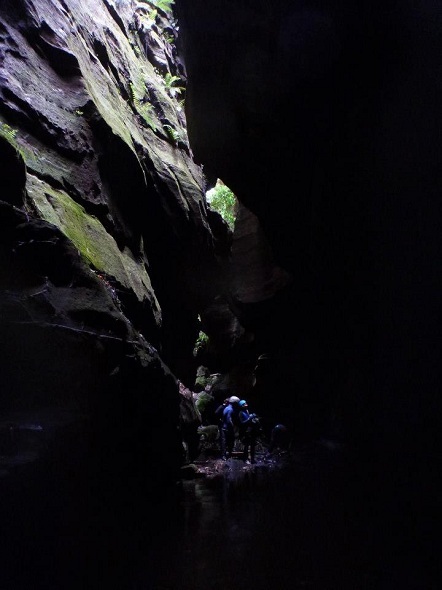 The canyon continued along in a nice, very dark fashion to the next abseil which plunged again into a dark hole I couldn’t see the bottom of. Not long later Horseshoe finished out on the Wollangambe, with only a short stroll upstream to the same track we entered on. We all powered up the hill back to the Fire Station to find Ulla after a quick search of the neighbourhood. A wonderful weekend with a great selection of people. Until next time! Posted in canyoningcommentLeave a Comment on Four canyons. Two days. A whole lot of fun. Love the site. All the trips you guys do always look like fun! 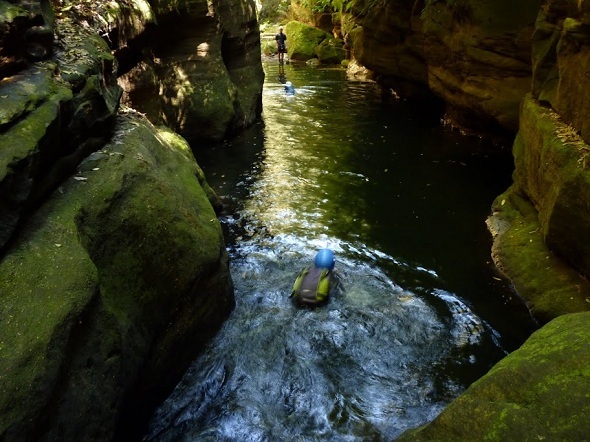 Quick question – for someone looking at getting into canyoning – how did you guys start? Was it self taught? What would you suggest? Michael, thanks for the feedback. The trips are fun, which is what keeps us going back for more! 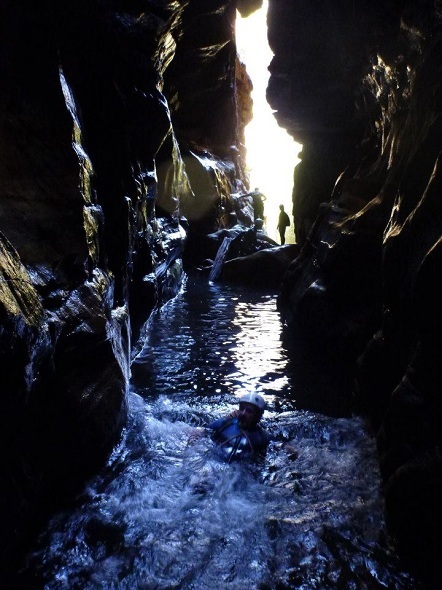 As for how to start out, for most of us we joined an outdoor club that ran canyoning trips. That way we were able to learn the basics of canyoning, including rope skills and navigation, before setting out on our own. You could also pay to go with a commercial group if you preferred. If you’re keen to learn and ask lots of questions it won’t take long before you can safely lead easier trips. I think I’d done about four or five trips before I started leading, but it is up to you when you feel comfortable and confident enough to strike out on your own. 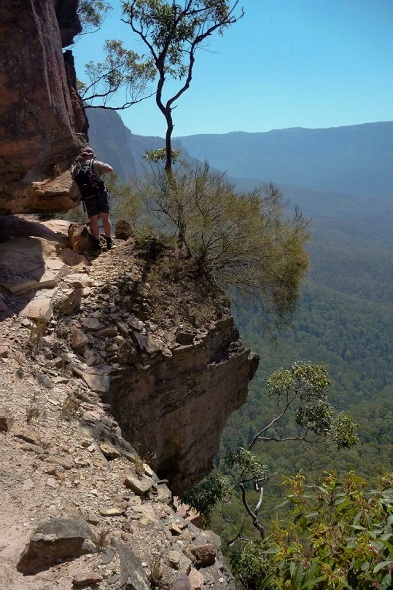 If you’re from Sydney you can find a number of bushwalking clubs on our links page, most of which have canyoning trips as part of their offerings.